Located nearly halfway between Genoa and the French border near Monte Carlo, on the northern coast of the Ligurian Sea, Finale Ligure makes for the perfect climbing destination. 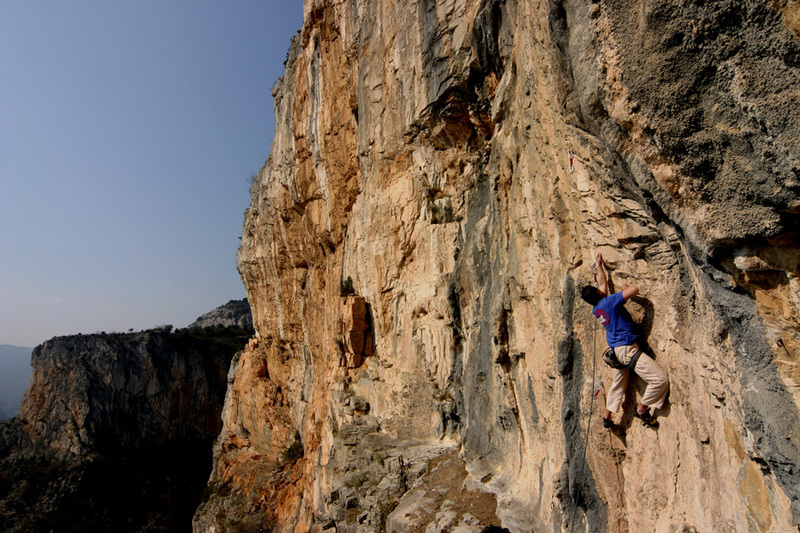 Finale Ligure is considered the crown jewel of rock climbing on the Italian Riviera. It offers over 2700 routes to choose from on white limestone rock. The rock climbing is situated in a succession of valleys in the hills behind Finale Ligure, and covers an area of 10 square kilometres. Located nearly halfway between Genoa and the French border near Monte Carlo, on the northern coast of the Ligurian Sea, a nice beach, a great medieval walled city, fine dining, plenty of accommodation, Finale Ligure makes for the perfect climbing destination. It offers a huge variety in rock climbing, from smooth and pocketed vertical walls, to steep overhangs. The style of climbing is technical, usually with the crux near the end of the route. The routes are mainly single pitch, though there are some bolted routes up to 3 and 4 pitches long. It is possible to climb throughout the year, though the best time is spring and autumn. Bric Pianarella: from 1 to 9 pitch routes, one of the taller venues in the area. Rocca di Perti: Visible from the A10, this crag is big, 13 sectors, over 300 routes. Rian Cornei: A cluster of 19 sectors in this large area. Monte Sordo: 5 sectors of some of the most enjoyable climbing in Finale. Rocca di Corno: One of the first cliffs to be climbed in the area, and, still one of the nicest. Sunny with a great vista and four sectors. Nice view of a Roman bridge. Further along the coast is Capo Noli, which offers great sea cliff rock climbing, very different from Finale. OltreFinale - Towards the French border there are a series of valleys that, over the years, have become known as the OltreFinale crags, the alternative crags to Finale Ligure. In total there are 5 valleys, 80 climbing sectors and hundreds of routes across a wide range of grades on solid limestone rock. Muzzerone - Between Sestri Levante and La Spezia, this area offers a wide choice of sea cliff rock climbing. The routes range from single pitch routes on slabs to steep and overhanging multi-pitch routes across a wide range of grades. Here the rock climbing is on very good quality limestone rock that has recently been re-bolted. Andonno - Close to the French border, Andonno is another great rock climbing area. There are over 200 routes, mainly single pitch with some multi pitch routes. The Club Alpino Italiano in Finalborgo is a good source for information on the area. Rockstore in the walled city of Finalborgo is the area climbing shop. Distances to Finale Ligure: 130 km from Nice, 75 km from Genoa,160 km from Turin, 200 km from Milan. It can be reached by the A10 freeway.